Although the wedding season hots up over the summer months (if you’ll pardon the pun…), there’s still a lot to be said for planning an autumn wedding. The glorious colours in the trees coupled with the softer light and seasonal mist can result in stunningly evocative scenes that are just begging to be photographed. If you are arranging an autumn wedding, here are some ways to ensure that your photos do the season justice and you end up with an album of memories to be proud of. As autumn starts to move towards winter the days grow shorter, so make sure you discuss and plan the timings of your photos carefully with your photographer. While you may want to wait for the soft glow of late afternoon to add a misty, whimsical feel to your shots, don’t leave it so late that the sun disappears and you are left with awkward shadows to deal with. 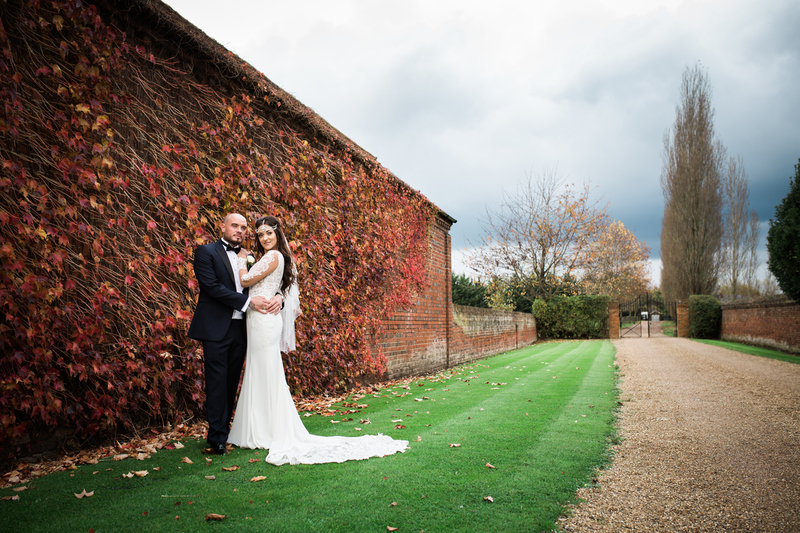 Try to visit the venue a few days in advance at the times when you are planning to have the photos taken and work out where to go in the grounds and the angles and directions you should stand in. You may wish your photographer to take some mock shots at the venue, not only to practise, but to discuss your ideas, fears and must-have shots with the photographer. Autumn weddings offer huge scope for seasonally-inspired details, e.g. seasonal fruits piled in a bowl, candles tied with raffia and branches of golden foliage or carved pumpkins at Halloween. Make sure you ask your photographer to capture these details, as they will help tell the story of your autumn wedding. Don’t forget to ask for pictures of any finishing touches to your outfits or flowers too. Many autumnal weddings feature rich reds, browns and golds in the wedding bouquet or venue flowers. Or you may have chosen autumnal colours to set off bridesmaids’ outfits or the wedding cake. Other autumnal details, such as a fire pit, lanterns or candles can also make for some stunning pictures. Autumn isn’t called the ‘season of mists’ for nothing and the softer light can create some amazing photographic effects. Make the most of any less than perfect weather than you may encounter to enjoy some hazy, romantic photography, perhaps sitting by a lake or in a woodland. A dramatic sky can also help counterbalance the mist in a wider panorama or a group shot and dew or raindrops can look charming on surrounding foliage or even in a close-up of the wedding bouquet.